BEDFORD-STUYVESANT — A Bedford-Stuyvesant yoga studio is getting ready to expand to a new cafe, complete with a juice and kombucha bar. Good Yoga is renovating the garage in the back of its 602 Myrtle Ave. storefront to make room for the new shop, called Goodies, which its owners say will help improve the level of community involvement in the studio. "Our gut instinct was to create a place where people can sit and talk," said Flannery Foster, co-owner of the Yoga mini-franchise. "If there's something that is complementary and beneficial to the community that we can provide a space for, we're excited to do that." Foster started Good Yoga with partner Raymond Gonzalez in 2009, with a studio in Greenpoint on 73 Calyer St. They now have three locations, including the studio in Bed-Stuy, which opened in October of last year, and one in Bushwick, which opened in December. The two owners started Good Yoga as a way to bring a more welcoming feel to the practice, which Foster said can sometimes feel intimidating to first-timers. "We wanted to make yoga accessible to everybody," Foster said. "We don't have to have our 'New York armor' on." The studios also offer a work exchange program for those who can't afford classes, on an hour-for-hour exchange, Foster said. Foster and Gonzalez's Greenpoint studio also houses a bed and breakfast, which includes a lounge where yoga students can sit and get to know each other. The Bed-Stuy location was originally opened under the name Nirvana Yoga by a former Good Yoga student. But due to a family illness, he had to pass off the business, and the storefront became Good Yoga's second location. One of the benefits of the new shop was the addition of the garage, located on the east side of the building on Taaffe Place. The two owners were looking for ways to use the new space, and thought it could serve a similar function to the Greenpoint lounge. "The most important aspect of 'community' is what happens in that lounge," Foster said. 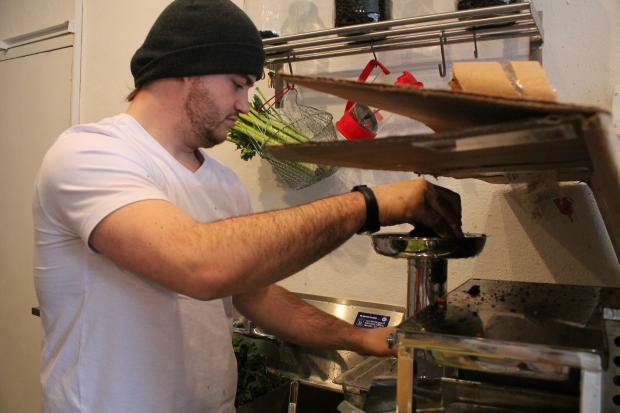 Goodies will offer up fresh juices, homemade kombucha, tea and coffee, said the shop's manager, Max Kelly. Eventually, Kelly said, they'll start to serve small food items. Kelly said the store is looking to open by the end of March. For now, they're putting the finishing touches on renovations and preparing the menu. "We're just sort of getting our recipes down, and getting the kinks out," Kelly said. Rather than focus on high-sugar fruits like apples, they're trying to focus more on leafy greens, like spinach and kale, that are richer in nutrients, Kelly said. Good Yoga members can currently make specialty orders, but once the cafe officially opens, even people who aren't signed up will be able to take advantage, Kelly said. "That's kind of the focus, it's a service to them," Kelly said. "But we're eager to serve the public as well."